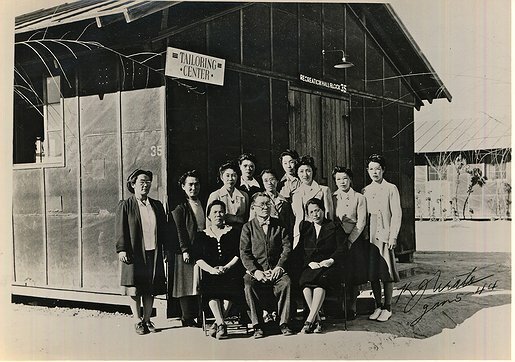 After the inital trama of imprisonment, the Japanese American inmate community with the help of the Office of Indian Affairs (OIA) and the War Relocation Authority (WRA) wanted to to ease the stress of imprisionment. (The OIA managed Poston for the WRA for the first 2 years.) Stress was successiful eased by adding educational, recreational, and sporting activities for almost everyone. 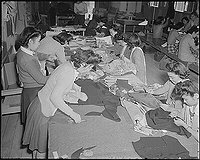 One major success was the Poston Tailoring School where hundreds of inmates learned tailoring and were able to make clothing for themselves and their families in the camp. 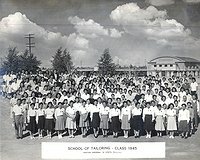 See the photo of the large graduating class of 1945. 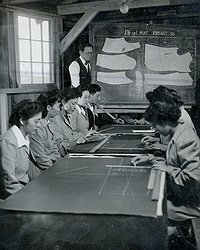 The school was headed by Kesajiro Urata a 71 year old tailor from Los Angeles. 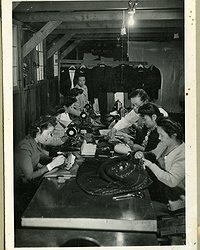 Sewing machines were in short supply in the camp but fortunately for the inmates, a Los Angeles Japanese American owner of a sewing factory was interned in Poston. 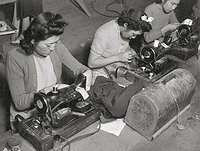 He offered to lease his machines for a small fee and his sewing machines were sent to Poston. 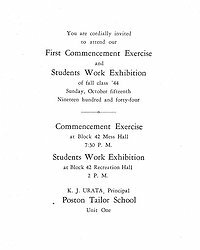 Mr Urata gathered up inmate tailors and trained inmates to become teachers of Poston Tailor School. My mother Michiko Kakuda became one of these teachers and was very honored to teach under Mr Urata's tutorage. 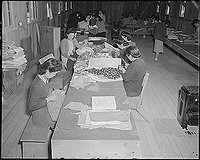 Cloth and tailoring accessories were purchased via Sears and Roebuck and Montgomery Wards catologs or the Poston Cooperative Store. Banking services were supplied by the Bank of America at Poston. Recreational Hall Block 35. Kesajiro Urata head to tailoring school sitting center. Tailoring school teachers with Head Tailor Mr Kesajiro Urata. My mother Michiko Kakuda is left in foreground. Teachers and Students in class room. Head of school K. Urata and assistant. Teachers with K. Urata Head of Poston Tailor School. Michiko Kakuda top row second from the left. First commencement of the Poston 1 Tailor School. Poston 1 Adobe school and auditorium in backgrond. Teachers are wearing badges. Head of school K. Urata 3rd row on right of photo. Michiko Kakuda 7th from the left in front row wearing skirt made from Army blanket. Suit tops vests and dresses made at the Poston Tailor School. Photo taken at the Poston Fair. Note the Poston families Gold Stars represented with wooden rifles and flower arrangement. Display at the Poston Fair where produce, products, hobbies and clothing were shown. Suit tops made at the Poston Tailor School. Photo taken at the Poston Fair. 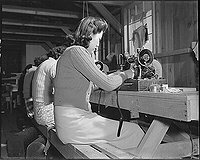 Women taking a tailoring class. Note the space heater, the dusty wooden floor, and gaps in the door and walls. Students of the Tailor School cutting patterns and hand stitching. Cloth and tailoring accessories purchased via Sears and Roebuck and Montgomery Wards catologs or the Poston Cooperative Store. RoyKakuda — Última actualización Jul 18 2018 11:56 a.m.